Many people have expressed curiosity of what my hands and feet looked like during the time of they hyperbaric chamber and surgeries. Whether it’s idol curiosity, a want a better understanding of my journey, or some twisted interest, I’m showing the pictures from several of my appointments. 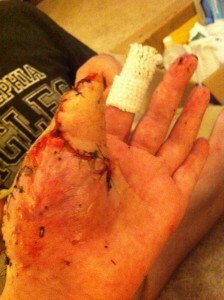 Please do not look if you have a weak stomach or no interest in this part of my story. Either way, I keep these photos in the front of my mind and look at them quite often to remind myself how far I’ve come in just a short amount of time. From relearning to walk on weeping blisters to running and Zumba-ing in just six months, I say that is quite an accomplishment. 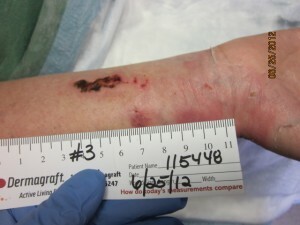 The following pictures were taken at Wound Care Center at Sacred Heart Hospital in Allentown, PA. 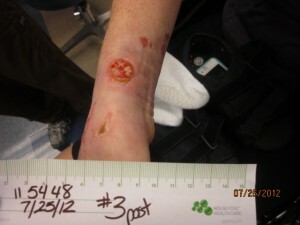 I was at Moss Rehab, located in that hospital, during this time. It was just two days earlier when the podiatrist saw me and mentioned double amputation up to the knees. 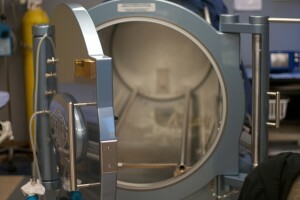 I needed the hyperbaric chamber to work. My right foot. 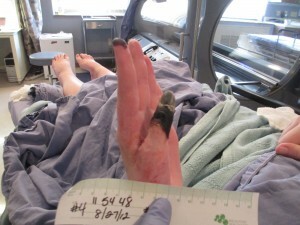 That dark spot just below the nail on the big toe was worrisome to the doctors. If it went down to the bone I would most likely have lost my toe. Notice how swollen each toe is. My pinkie toe was also on the fence at this point. The bottom of my right foot. Sick note: The section of loose blistered skin just sloughed off by the heal and you can see fluid dripping from my foot. My left foot. 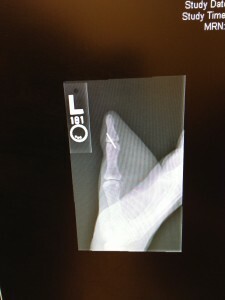 My fifth toe, or pinkie toe, is the one that I had amputated. At this point the podiatrist thought we may be able to stimulate the tissue. 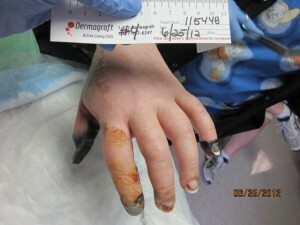 Unfortunately, unbeknownst to us the gangrene went to the bone. The bottom of my left wasn’t as bad as my right but still had a lot of tissue damage to it. Right hand. No one really knows why my right hand exploded like it did. 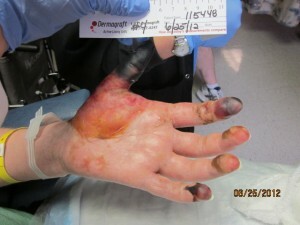 I had blood drawn on my hand on that Sunday night so they think the infection just attacked it. Left hand. My fingers were still pretty swollen and curved. When I first woke up my left hand looked like a bear claw and I had to practice straightening them. You can see how my thumb caved in from this view. It puffed back out after just one hyperbaric treatment and I was embarrassed to admit that I still had hope for my thumb. At this point my thumb hasn’t caved into my palm just yet. You can see that one point my entire palm was a blister, as well as each finger. Mepitel, used to put over open wounds so the gauze or wrap won’t stick to them, is covering my toes. There is no medicine on them. 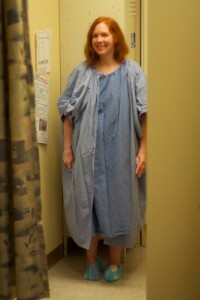 I was not allowed to wear anything other than my two hospital gowns while in the hyperbaric chamber. No gels, or lotions were allowed in the room because of the oxygen. You can tell that all that dead skin coming up from underneath the bottom of my foot stretched up over the top of my foot. I didn’t have any feeling yet in my feet, which was great because that one cut looks painful. They told me it would get worse before it got better. The spots got darker which concerned me but they reassured me it would be all right. 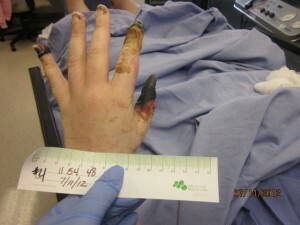 My first hand surgeon was worried about my pinkie finger and index finger. He thought the black went all the way to the bone. Glad to prove him wrong. Just a month in and already there is remarkable improvement. 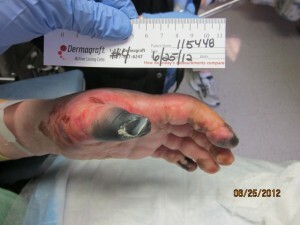 Every Friday at the podiatrist he would find another second that would just peel off revealing brand new, pink skin. Bottom of the foot is all clear. This is called hyper-granulated. It’s when your skin overgrows the wound. They had medicine they put on it to slow down the growth. 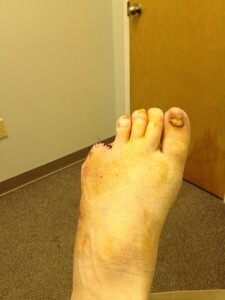 Moving right along with my treatment, my feet are amazing everyone and now there is only talk of losing pinkie toes. Right foot, almost all clear! Pinkie toe deemed saved! Now just the tip to go. At this time I’m thinking that my fingers are saved and that first hand doctor is crazy. At this point I love going to the podiatrist because he finds more and more pink on my feet. Feeling is returning, which is very painful, but I welcome the intense pain because that means I’m one step closer to being “normal”. Left foot. Just that pinkie left but sadly it never recovers. 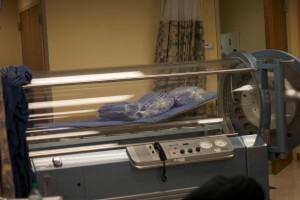 Many people questioned what the hyperbaric chamber was or did. Most often they are used for scuba divers who come up to the surface too quickly and they get what is called the bends. In my case my podiatrist wanted me to start ASAP because of how they help aid healing. Oxygen helps heal. Just sitting here we are breathing only 20% oxygen, inside the chamber I was breathing 100% pure oxygen at twice the atmospheric pressure. The higher pressure allowed my blood to carry the pure oxygen at a faster rate. Also, for reasons unknown, plasma, which is not normally a carrier, will carry oxygen around. Talk about more bang for your buck. In the chamber I couldn’t wear clothes, medals, glasses, perfumes, or lotions. Just two oversized cotton gowns. Getting ready to go in. Blood pressure and temperature are checked before and after each time I went in. Grounding bracelet to lower the risk of static electricity. I’m lying in pure oxygen, absolutely nothing flammable or that tube turns into an fiery coffin. The chamber from my point of view. When that vault door clicks shut it’s a bit unnerving. My home for two hours for 55 days. 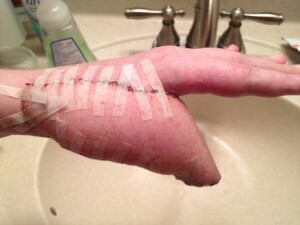 Should have been 60 but my thumb surgery was on my would be 56th day. I couldn’t hear anything happening outside of the chamber. They would use the phone to talk to me. I got their attention by knocking on the glass. Or by laughing so hard at a tv show that I rocked the chamber back and forth. Another risk is seizures. 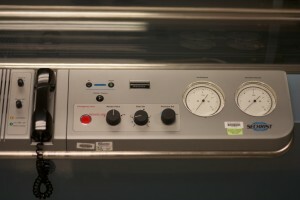 Due to the higher amount of oxygen one can develop seizures while in the chamber. To offset the pure oxygen every 30 minutes I had an air break. I would breath through a tube that was hooked up to a tank of regular air. I only had 2 panic attacks in the chamber. One was when my stretcher was too high and my forehead almost touched the top. The second one was when they were fixing the air conditioner on the floor and I felt like I was lying in an oven. Other than that I welcomed the quiet and relaxed. 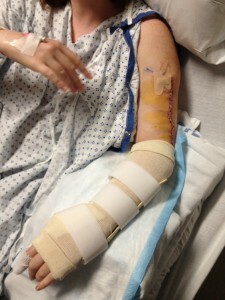 They used tissue from my left arm to make my thumb. 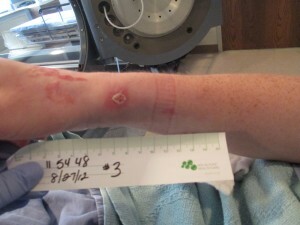 Since the bone was not badly infected they just wrapped the tissue around. 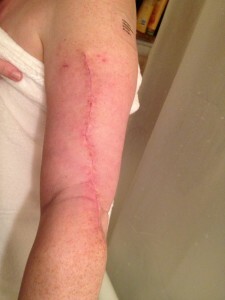 A week out from surgery. Two months out. 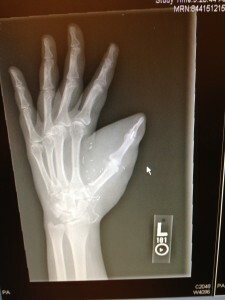 You can see where he fused my knuckle. Also all those little lines are capped off vessels that are no longer in use because of the surgery. 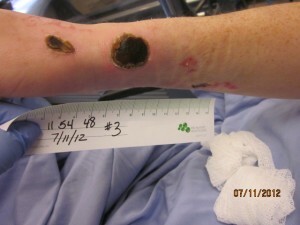 That is all extra skin that will be “de-bulked” in subsequent surgies. 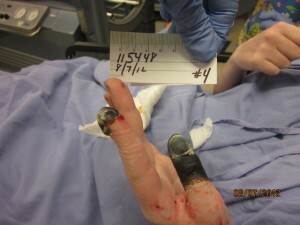 He needed to make sure the tissue survived and had enough extra tissue to help mold the thumb. 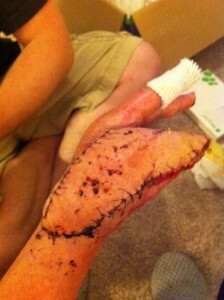 One the one month anniversary of my thumb surgery I had my pinkie toe removed. 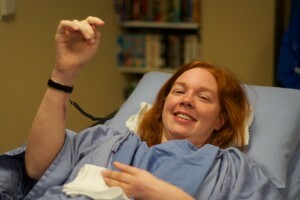 After going through the seven hour surgery with my thumb, this thirty minute procedure was nothing. 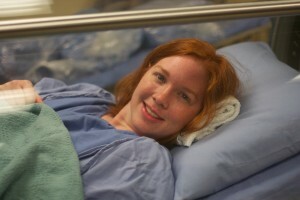 I woke up smiling and laughing with the nurses. I was told if I needed another surgery to come back to them. They liked me. Funny to say this was the hardest part for me. Even when the podiatrist told me about possible leg amputation I knew deep down inside that I would be all right. I just knew that it wasn’t as bad as all that. Call it naivety or call it intuition, but it turned out to be true. 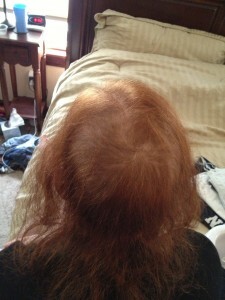 What I couldn’t handle was my hair loss. As vain as that may sound it’s the truth, I’m not proud of it but there it is. 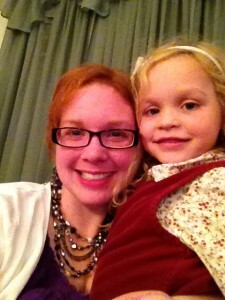 I am known for my red hair. I have people on Twitter that followed on me because of it. Losing it was not something anyone prepared me for. In fact, no one knew why it was happening. Was it the pain meds? Was the shock to my system? No one knows a definite answer but the common theory is that is most likely from the shock to my system. 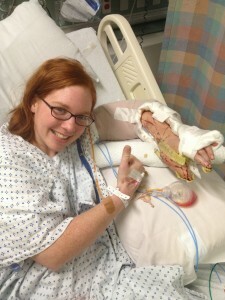 During that time when I was in the ICU my body basically shut down and rebooted. I like to call the new me Karen 2.0, better then ever, baby. Things that were wrong or not right with me were no longer a problem. However, in order to start over, I needed to start over with everything. 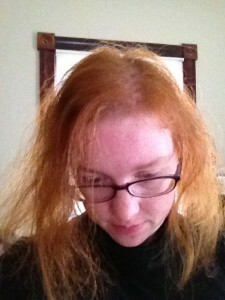 And that included my hair. A month before I got sick. This picture was taken on October 20th. 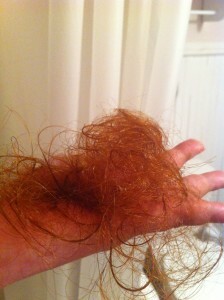 Not yet at the worse of my hair loss but you get the picture. No one believed me when I said that my hair wasn’t growing. Then this starting happening when Eric washed my hair. I cried every day he washed it. My dad would joke that I fit the family hair line then. No matter what, I still laughed. You have to laugh, it’s better than crying any day. Thanksgiving. 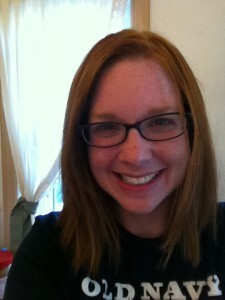 A new hair cut and a new hair care routine that has my hair growing faster than I ever imagined. I now I have little sprouts all over the place. No computers were harmed in the 0.188 seconds it took to produce this page.